Nectar of Life: Flower thieves of Belgaum. It is really sad to see that they will not only pluck the flowers, but also the buds, that too, very tender ones! They can be so hard hearted that they may not leave any flowers for the lady of the house. On the road divider in front of our clinic, we got some flowering plants maintained by a gardener. The watering is done from our clinic. We had a dream of looking at the flowers from the clinic windows. But the local flower thieves will not leave even buds on the plants. 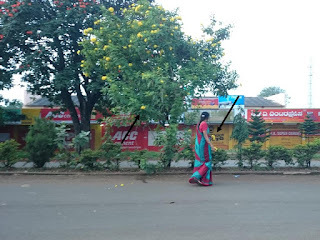 Many times, on our way to yoga class early morning, we will encounter these ladies plucking flowers and buds. When I try to stop them, they will say,’ It is for the Gods. We do puja with them”, as if they are doing a great service to the humanity! When I reply, “God won’t accept flowers got by stealing. You have to grow plants in your house and offer them.” If I thought that those words would make a dent on their conscience, it was my mistake. Aha! Look at her defiance. I responded, “These street lights are also on the road. Take away the light bulbs to your house, they are public property.” She immediately left, to come back later when I was gone. 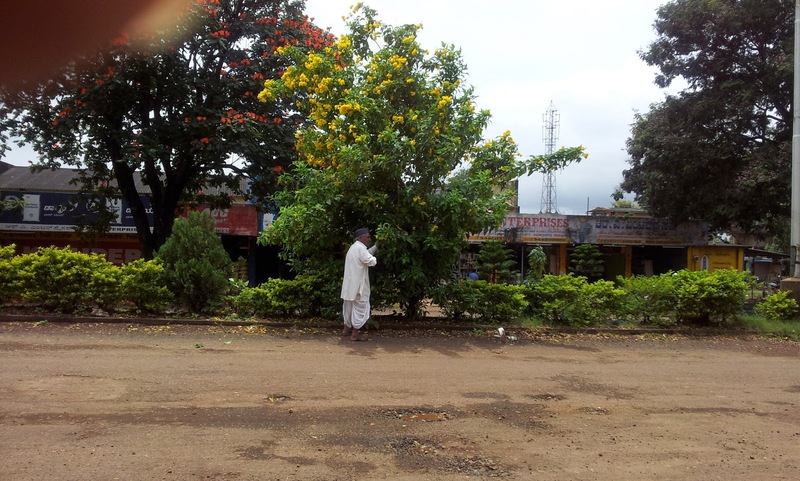 I have stayed in different parts of India, but this flower theft is most rampant in Belgaum. Established flower thieves will always have plastic bags with them to collect the flowers. Novices will keep the flowers in their sari pallu. Once in a while you can see some old men also doing the theft. I have only one mode of action, fold my hands and pray to God, to instill some civic sense in my fellow country women.